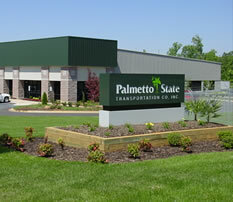 Palmetto State Transportation is a locally owned trucking company based out of Greenville, SC. Founded in 1991, Palmetto State has faithfully served the shipping needs of our customers for 2 decades. Pametto State was established with a clear vision of providing the very best transportation service available at a fair and competitive price. We are an ISO 9001 compliant company with measureable standards that are continuoulsy monitored and evaluated to guarantee the quality service our customers have come to expect. Palmetto State Transportation employs the most modern technology available to professionally handle your LTL, Volume, Truckload, and Expedited Service needs. We also offer Consolidation and Warehousing services. Our single terminal, load to ride delivery system assures you that your shipment will arrive on time and intact. The Palmetto State fleet consists of all air ride equipment which allows your shipment to enjoy smooth, damage-free transport. Our "state of the art" satellite tracking system gives you instant updates on the progress of your shipment. Palmetto State Transportation serves the Northeast, Midwest, Pacific Northwest, Texas, and California. Our Truckload and Expedited Services cover the entire United States and sections of Mexico and Canada. Whatever your transportation and logistial needs, the professional team at Palmetto State Transportation is available to you. The service you deserve is just a phone call away! Palmetto State Transportation Company, Inc. will pursue every opportunity for continual improvement functioning as a team to provide timely, reliable, safe transportation service for our customers.